The long-fabled Deadwood movie is real. Entertainment Weekly has revealed the first photos of HBO’s film revival of the beloved, short-lived series, coming in spring 2019. The first image reveals Ian McShane’s Al Swearengen up to his old tricks, back at his Gem Theater bar and giving a deadly stare. Meanwhile, in the other image, we see a grey-mustachioed Seth Bullock (Timothy Olyphant), now serving as a U.S. Marshal. Set 10 years after the events of the original series, which ran for three seasons from 2004-2006, HBO’s highly anticipated Deadwood movie finally started production in early November. In addition to McShane and Olymphant, a stacked returning cast has also been confirmed for the forthcoming feature: Molly Parker (Alma Ellsworth), Paula Malcomson (Trixie), John Hawkes (Sol Star), Anna Gunn (Martha Bullock), Dayton Callie (Charlie Utter), Brad Dourif (Doc Cochran), Robin Weigert (“Calamity” Jane Canary), William Sanderson (E.B. Farnum), Kim Dickens (Joanie Stubbs) and Gerald McRaney (George Hearst). They are joined by cast newcomer Jade Pettyjohn (Caroline), soon to appear in Karyn Kusama’s Destroyer. 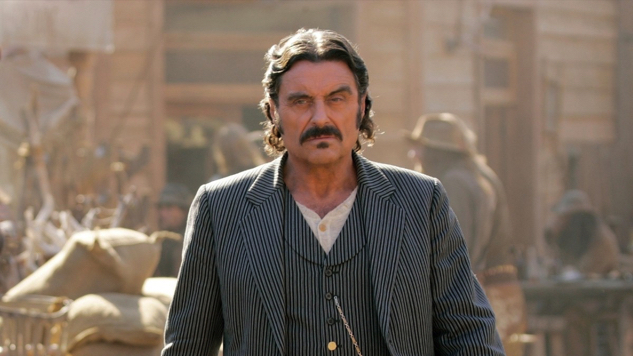 Deadwood creator David Milch returned to pen the movie’s script, and Daniel Minahan, who helmed four episodes of the original series, will direct. The Deadwood movie is executive produced by Milch, Carolyn Strauss, Minahan, Gregg Fienberg, Scott Stephens, McShane and Olyphant. Tell your God to ready for Deadwood’s return on HBO in spring 2019, and revisit everything we know about the forthcoming Deadwood movie here.